Dressing in costume for Mardi Gras, the celebration before Lent, is a traditional part of the festivities. 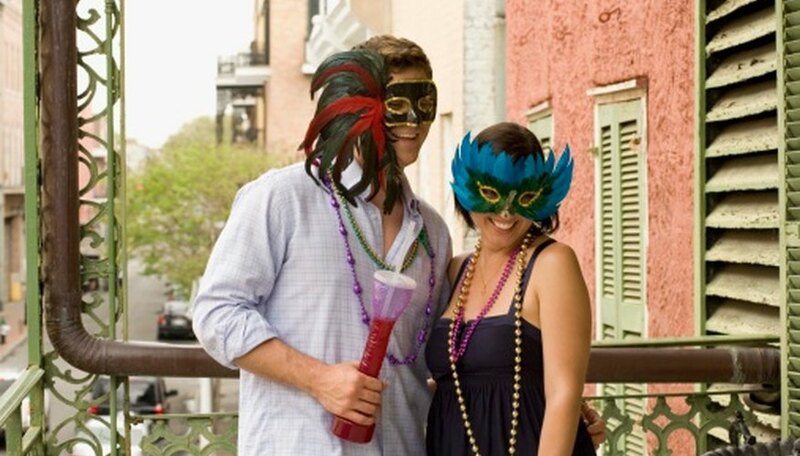 Revelers dress in full costume or just a simple mask, and there are limitless possibilities for dress up ideas. Having a jumping off point will give you some good ideas to discover for your next Mardi Gras celebration. The jester is a typical character for Mardi Gras celebrations. Banners and other decorations will sometimes have a cartoon image of the jester, leading a Mardi Gras parade and encouraging revelry. You can dress as a jester by donning the traditional jester hat in colors like purple, yellow and green, the Mardi Gras colors. Pair the hat with a brightly colored outfit for a complete look. Beads are synonymous with Mardi Gras, as party goers compete and work to win strings of plastic beads handed out all over New Orleans come Mardi Gras time. Consider making a costume made up of strings of beads as an homage to this. Glue strings of beads in layers over a shirt, a pair of pants and a hat, and go as a Beaded Man or Woman. A saint is a character you can dress as for Mardi Gras, as the celebration is tied to the Catholic religion. Wear long robes and carry a rosary, and consider pairing the outfit with a saint's or bishop's hat from a costume shop. This costume can be customized for a man or a woman. You can even get a group together and go as a mix of saints, priests and nuns. Jazz can be heard all over New Orleans, and you can tip your hat to the musical tradition by dressing up as a jazz musician for Mardi Gras. Wear a suit and fedora and carry a trumpet or saxophone with you. You can even carry a large, black umbrella to bounce above your head as you play, a custom found in the street bands of Louisiana.